PCN Flight West: NWA Capt. David E. Windsor Sr.
NWA Capt. David E. Windsor Sr.
Capt. David Edward Windsor Sr. Notification of the passing of retired NWA pilot Capt. David E. Windsor Sr., age 74. Captain David Edward Windsor, age 74, of Palm Beach Gardens, formerly of Quincy, Illinois passed away on June 22, 2012 at Jupiter Medical Center. David was born in Quincy, Illinois on April 29, 1938 to Everette and Mabel Windsor. 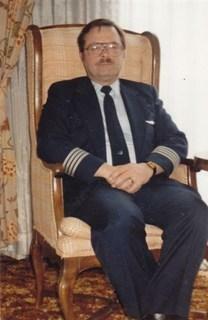 David was a airline Captain for Northwest Airlines for 31 years. He loved golfing and putting together model planes. David is survived by his loving wife of 28 years, Janette; his children David, Timothy, Jeff and his wife Lana, Heather and her husband Mike, 5 grandchildren, 1 great grandchild, and his sister Janet and her husband Jerry. David was preceded in death by his son Gregory. A Celebration of Life Service will be held on Tuesday, June 26th at 11 am, Aycock-Riverside Funeral and Cremation Center, 1112 Military Trail, Jupiter.